Burt’s Mammoth Series is similar to the Modern Library’s Giant Series – larger format (larger than the publisher’s main reprint series) and longer titles (or omnibus editions) issued at a relatively low cost ($1 in the case of the Mammoth Series). Both were undoubtedly a reaction to the continuing strong sales of larger format reprint series such as those issued by Grosset & Dunlap. These larger format series often advertised the fact that their books were larger and longer than popular series such as the Modern Library. The Mammoth Series seems to appear around 1932 (Modern Library Giants were first issued in 1931) and contains some of the same titles that were in or would appear in the Modern Library Giant series (The Wandering Jew, Les Miserables). Jackets were common to the series, a geometric design with contrasting colors designed by book illustrator Samuel Bernard Schaffer. 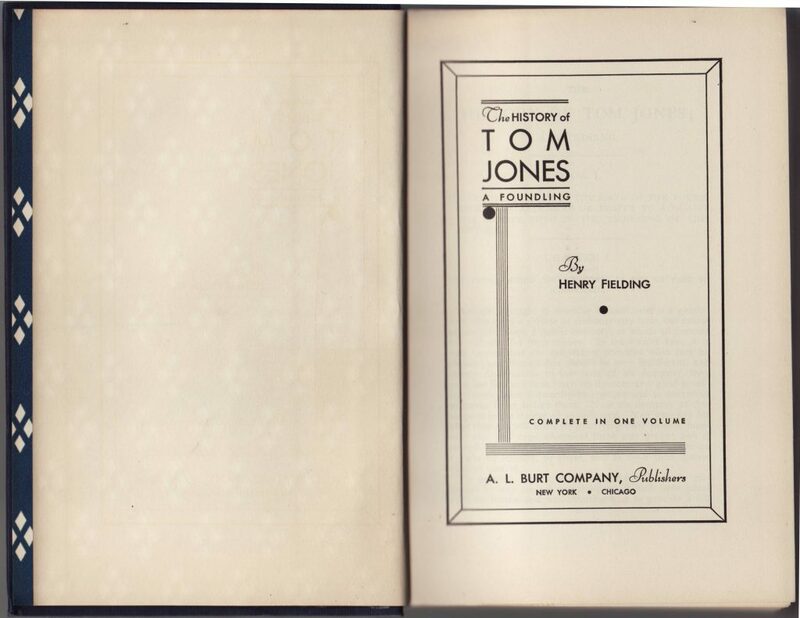 This copy of Tom Jones by Henry Fielding has no publication date but was probably issued early in the series existence. The series name is indicated at the bottom of the front of the jacket. 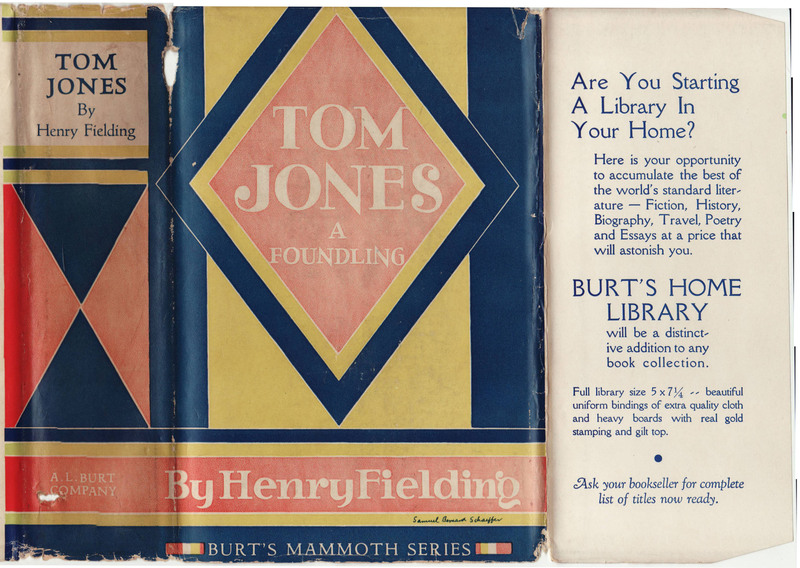 The front jacket flap advertises Burt’s long-running Burt’s Home Library series. 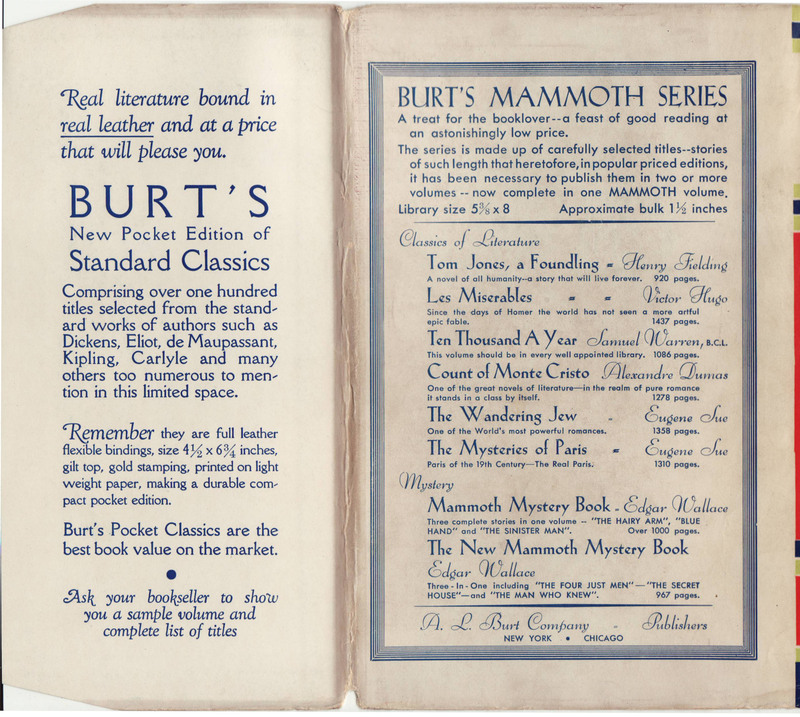 The rear of the jacket advertises Burt’s Pocket Edition of Standard Classics. The back of the jacket blurbs the Mammoth Series and lists eight titles. More titles seem to be added later: a listing below includes titles that seem to have been in the series (although in some cases the books are referred to as Mammoth Books and I’m not sure this is the same series). All of the titles below seem to have been issued in the same time frame as Burt’s Mammoth series and are probably part of that series. 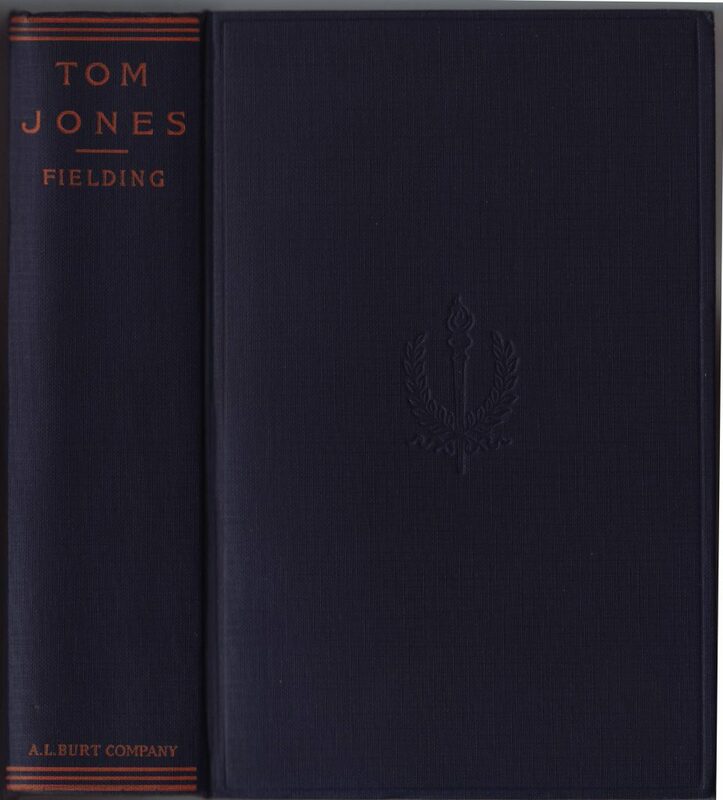 Bindings are cloth, dark blue with red printed typography and a debossed graphic element on the front of the book. 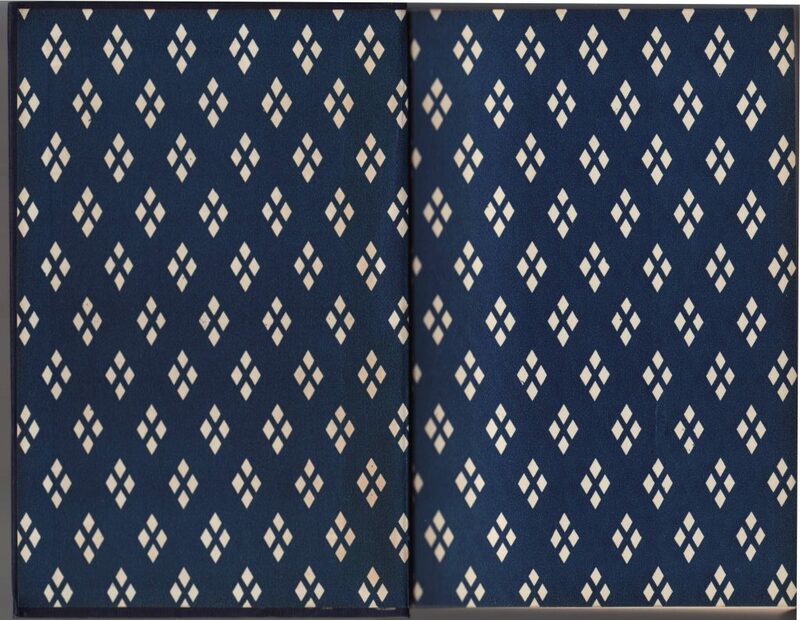 Decorative endpapers mimic the geometric diamond design used on the jackets. There is not half-title page. 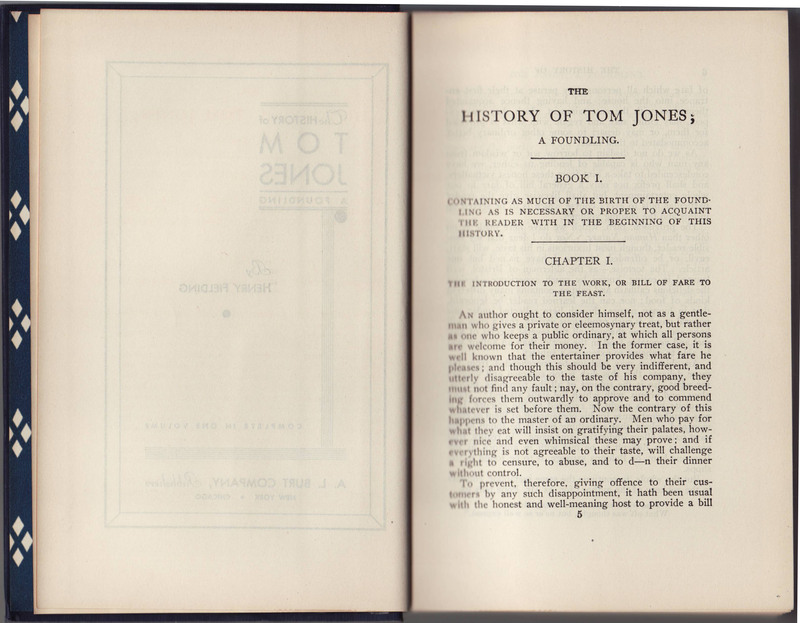 The title page consists of a rather progressive modernist design, possibly also created by the book jacket’s designer. The book lacks a copyright or date of publication. The text block is small suggesting this larger book was originally printed at a smaller size.